Hey everyone! Hope you are well! First of all let me just apologise for being so slow with blog posts lately. I've been so busy with work and family stuff that I have barely had time to even sit down and breathe. However I have a day off today so I thought why not sit down and get a few posts typed up. 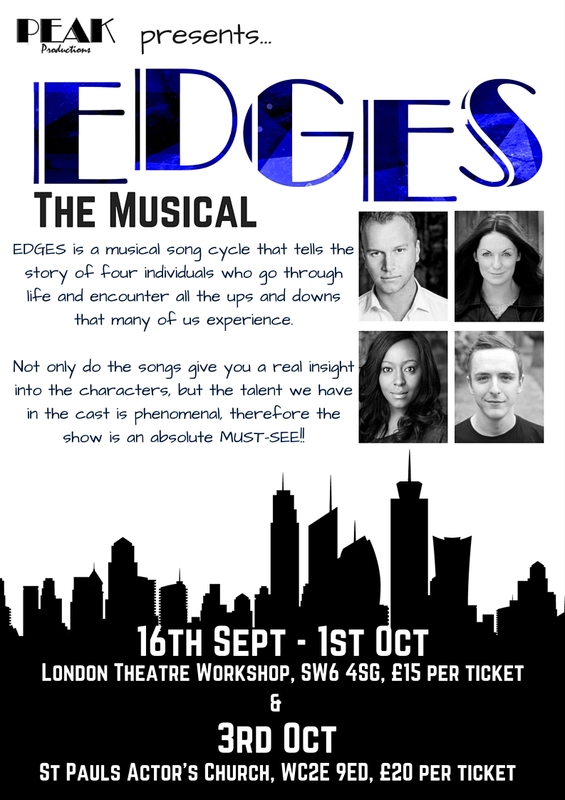 I thought I'd start off talking to you about a new show I've seen recently called Edges The Musical. Edges is originally a musical by two guys named Benj Pasak and Justin Paul. I had never heard of this show until around a month ago when the productions company 'Peak Productions' set up by the lovely Michael Auger from Collabro caught my attention. As I'm sure most of you are aware I absolutely lovely musical theatre and the way it can relate to different aspects of your life and transport you to a completely different place. I also love Collabro so when I found out Michael was producing it and Jamie Lambert was the vocal coach to the four cast members I knew it was something that I really wanted to support and be a part of. I've been keeping an eye on Michael's twitter and the Peak Productions twitter (Peak Productions) since he announced that he was the one behind this new company and found out more about the show by listening to interviews he has done about it. I love how he's presented everything on social media from introducing us to the cast members to showing us snippets of the songs in the show to even the cast in rehearsals. Because of this it definitely wasn't one I had any intention of missing. The show basically follows the story of 2 girls and 2 boys growing up and how they deal with different aspects of every day life, both the good and the bad such as family and relationships which is definitely two things most of us can relate to! I bought my tickets straight away for opening night which was the 16th September and wasn't disappointed. The cast of Edges consisted of Lauren Allen, Chris Barton, Claudia Karuiki and Robert Woodward. Amazing is an understatement for how good this group of people are. Lauren has the most lovely voice and her version of the song 'Man Of My Dreams' was just stunning. She has such a quirky character and that really comes across on stage which I love. Chris Barton not only has the most incredible voice but his acting is amazing and he made me laugh loads during his version of 'In Short' especially as it's a song most of us can somehow relate to. Claudia is just a power house! The voice on this girl is just incredible. I had goosebumps and a lump in my throat every time she performed. Her version of 'Ready To Be Loved' is amazing and is the one song that I haven't been able to stop singing as it has been stuck in my head since Wednesday evening. I relate to it so much! Robert has got a beautiful tone to his voice too and the song 'Boy With Dreams' is so beautifully sung and takes you back to a time where you were in that exact same position in your life. I also loved the duets throughout the show as well especially of the songs 'I Hmm You' and 'Caitlyn and Haley'. These four cast members are going to be huge one day and I can't wait to see where their involvement with this show eventually takes them! If you love the sound of this show then it is currently running every evening from now until the 1st of October at the London Theatre Workshop in Fulham which is a small fringe theatre above a pub on New Kings Road and then it finishes in the St Paul's Actors Church in Covent Garden for a 2 show day on the 3rd October. All you have to do is just click the link HERE where you can buy tickets. I would highly recommend it if you love shows with good music, talent, humor and emotion or just want to experience something new. It's just amazing and I'm definitely heading back to see it again before it closes. I also can't wait to see what Michael decides to do with the company next as he has done such a fantastic job with this show. I'm excited to see where this will take him! I'll end this post here by saying Edges is an incredible musical, with an insane cast and amazing team behind it. I absolutely loved it and reckon that you would be seriously crazy to miss it. So go on...click the link above and buy your tickets now before it closes on the 3rd October. You can also keep up to date with Edges by following Peak Productions on Facebook HERE and on Twitter HERE. Have you seen or heard of Edges before?